The playground industry has undergone rapid advancement over the last ten years in Australia, with many exciting options available to caring providers of outdoor play environments. However, one type of advancement has been slow to emerge, that is the availability of a quality range of outdoor sound and musical items and instruments. KIM BOWMAN has recently developed a range of robust outdoor musical instruments which are both aesthetic and original. The sounds they make are harmonious and melodious, without jarring or being overly loud. In addition, the items he makes have a sculptural quality. KIM has an artist’s eye for making quality items which in themselves are practical and beautiful. KIM’s items add a new dimension to the experience of outdoor play: a child’s senses are stimulated by sound and touch, a child’s sense of wonder, pleasure and exploration is enhanced, the child is rewarded by the “cause and effect” of this kind of play. 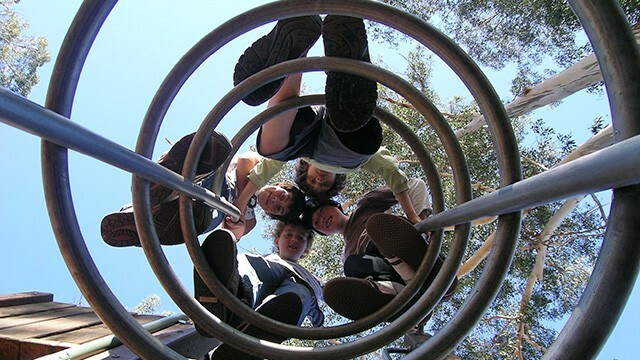 Importantly, KIM understands the requirements of the Australian Standards for Playgrounds, and his quality instruments meet the high standards necessary. As one of Sydney’s specialist playground designers, I have been searching for locally made playground instruments and sculptures such as KIM’s. We incorporate his work in our designs without hesitation, and whole-heartedly recommend them to others. We would be glad to answer any questions on KIM’s instruments and sculptures.